A pretty common weekend dinner for us is homemade sushi and lately I’ve purposefully prepped enough of the ingredients that I can make a sushi salad for lunch the next day. 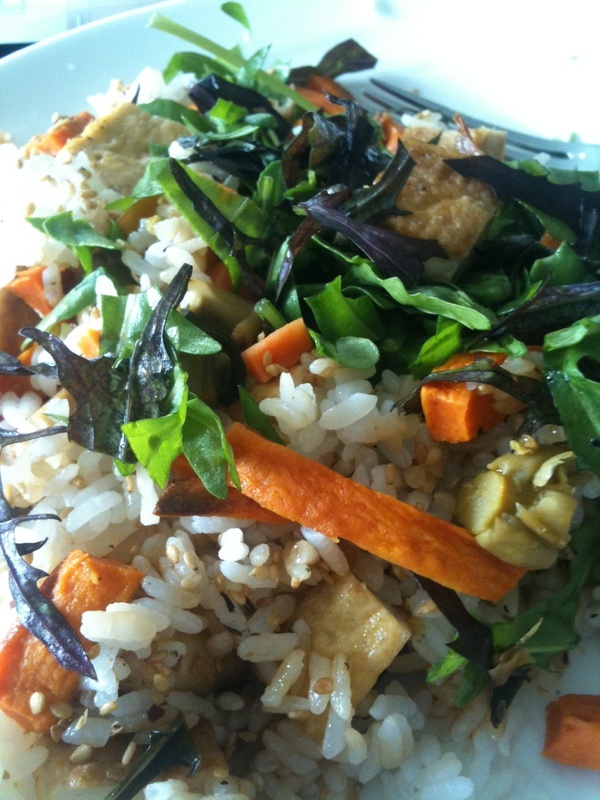 Our garden is producing a lot of arugula and mustard greens right now, so I picked a plateful, topped it with a scoop of sushi rice, then added chopped roasted sweet potato, fried tofu, and pickled vegetables. A sprinkle of peanuts (garbage salad-style) or sesame seeds adds some extra protein and crunch, then I dressed it with a sesame-soy vinaigrette. Delicious! Love this idea. Much easier than rolling (at least for us!) and we can do a decomposed version for the food-not-touching each other crowd. Oh, yum! I can imagine this going over pretty well for dinner here, too.